Find pages on and linked from the Clan MacMillan International (CMI) site listed below. After "Members' login" is a list of members' pages (password access only). 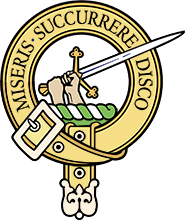 To gain access to the members' section one must be a current member of Clan MacMillan International or one of the Clan societies which meets the Conclave Challenge helping to support the efforts of our Chief, the Clan MacMillan International Centre. Above, MacMillan Dress 1874-2000 tartan. See more about Clan MacMillan tartan.